t*rexes and tiaras: Friday Favourites 117.. Yes, yes, more coats. So shoot me. With the turn in weather, I've been wearing some of my coats this week and I think I've established a couple of gaps in my collection. 001: Although I have a pink coat (or two), I don't own a duffle coat. They always strike me as being suitable for the less formal occasions, which some of my swing coats (including my pink one) are most definitely not, so it seems to be a duffle coat would make good sense. Plus, look how cosy it looks inside! 002: I don't have a purple coat. What is that about? 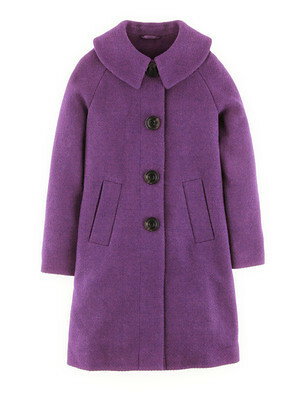 And frankly, how can one be expected to create a coat rainbow without a purple one? Have you established any gaps in your outerwear collection? What are you wishing for this week? of course I had to like the expensive Boden one. I really need a new winter coat, my old one doesn't fit and the only one I've got is a ugly waterproof one, yuk! I'm a big fan of duffel coats and I seem to be amassing a bit of a rainbow collection - I don't have a pink one and that DOES look snuggly! The purple one is stunning! I love the idea of the pink one for fireworks night! Oh, mustard is such a perfect Autumnal colour for coats! It's so lovely, I have it wishlisted for payday. 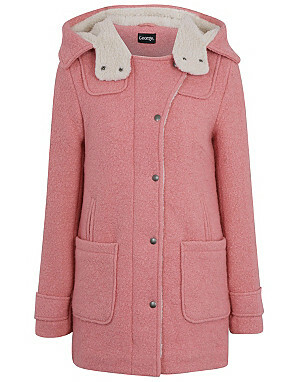 Ah I love the Boden Eliza coat in pink but that Asda one is a really nice (and very affordable) alternative!